Q: My daughter is moving and wants to take some of her plants with her but she has bindweed and ground elder in her garden. How can she move the plants and not the weeds? PD, Baffins. A: Tell her to dig out the plants she wants to move and look for the white roots of both of these weeds. Pull out the white roots so she doesn’t transfer them to her new garden. She’ll need patience. Q: I bought a pot of azaleas and there were four plants in the same pot. Once they finished flowering I separated them. Three have green leaves but one has very dark leaves. Is there anything wrong with it? MR, Fareham. A: Nothing to worry about. It is simply another variety. Q: Can you tell me the name of the ant killer you found to be so effective? PJ, Gosport. A: Ant Stop. The crystals are in little sachets. Scatter them in the area where the ants are active and they will gone in less than a week. I couldn’t believe how effective this was in my polytunnel which was infested. Q: I have a trachelospermum jasminoides which is smothered with a black substance. What is it? L le G, Hilsea. A: The black mould is caused by scale insects on the backs of the leaves and also mealy bugs. These look like white blobs. On a dull day spray the shrub with Provado Ultimate Bug Killer Concentrate underneath the leaves. Repeat the spray about an hour later on the tops of the leaves and a lot of the black film will wash off if you use a pump sprayer. A week later repeat the treatment. Fork over areas in the garden where summer flowers are intended. Scatter over 2-3oz of Vitax Q4 fertiliser to each square yard and lightly rake this into the soil’s surface. The fertiliser will then be active once the plants are planted after mid-May. If you notice worms lying on paths, they will have tried to get some water and failed to get back into the soil. Pick them up and put them underneath the soil. Do you love spring greens? Try sowing some seeds of the summer cabbage called Duncan. It is an F1 hybrid and the leaves are green while the plants are young. Sow single seeds in insert cells. Plant out once large enough to handle and eat the greens in 12 weeks. They can be sown like this every four weeks until August. Sow marrow, courgette and cucumber seeds indoors. 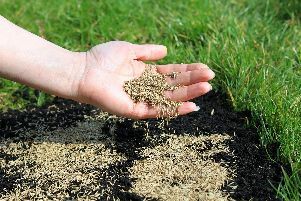 Sow the seeds on their edge, not flat, and you will get a much better germination rate. Continue to cover emerging shoots on potatoes and use the compost and potash as suggested last week to prevent slug damage. Scatter slug crystals between the rows. These crystals will not harm birds. They kill slugs by dehydrating them. Give early potato plants half a gallon of water to each plant, applied slowly. If the haulms look thin and weak, add a dessert spoon of Sulphate of ammonia to the water but don’t allow the mix to touch the leaves. Look at the roses to check for greenfly, a quick squeeze here and there where the groups of aphids are seen may keep them under control, but a spray of Multirose will be even more effective. Support broad bean plants. A very good way of doing this is to insert 4ft canes every four feet along both sides of the row and then tie in horizontal canes, a bit like a fence, the horizontal canes should be four inches above each other. This is a good wind-resistant method and especially good on exposed sites where high winds often break the plants when they are laden with pods. French beans, either the dwarf varieties or climbing types, can be planted directly into the ground. Dwarf beans are best planted eight inches apart in double rows, a foot between rows. There are usually quite a few ‘misses’ so sow a few extra seeds at the ends of the rows and these can be used to fill gaps. Scatter slug crystals because slugs and snails eat germinating beans as if there’s no tomorrow.